For some reason I really enjoy figuring out how to work decreases and increases into stitch patterns: witness all of my hats (Beaufort, Maple Seed, Rose of Sharon, Cinnabar, and Coin Cable) as well as the Chinese Lace Pullover and Wisteria child's dress (both based on the same stitch pattern), and the Dayflower Lace camisole. Even so, I was getting sick of my latest hat by the time I had plotted out the crown increases maybe ten times and swatched them, oh, a half dozen times. I'm going to look at the process I went through, in hopes of seeing how I might do it more efficiently in the future! I began by looking at the stitch pattern (see first photo), which has two distinct motifs: a mini zigzag with eyelets (pattern #1 in all photos), and what I'll call a fountain lace panel (pattern #2). Early on I decided I wanted the mini zigzag to begin as close to the crown as possible, and my first swatch reflected this, including beginning the purl stitch borders in the first few rounds. Issues with the first swatch: I felt that the patterns overall just didn't "read" very clearly, and I thought including the purl stitches early on was at least part of the problem. In this swatch, I decided to wait until much later to begin the purl stitch columns which divide the two motifs in the final stitch pattern. I also tried using more paired yarnovers for the increases, because the fountain lace pattern uses paired yarnovers. Certainly the two stitch patterns would be harder to distinguish if I hadn't circled them (and these swatches are unblocked); nevertheless I felt the mini zigzag was clearly established early on in this swatch, and the fountain lace panel has a nice symmetrical look to it. Unfortunately, the increases came on much too fast in the above swatch, yielding a pretty ruffled look completely unsuitable for a hat crown! In looking back, maybe I should have been able to foresee this; although I've found that lace patterns in particular can be very forgiving of irregular increases and decreases, there is surely a point where blocking will not smooth things out. I tried a couple of swatches with single yarnover increases (not pictured), but the problem was making the beginnings of the fountain lace panel look symmetrical. I then went back to including purl stitches early on (next swatch), which helped define the mini zigzag, but didn't do much for the fountain lace. At this point I had also decided that one of the nice things about the fountain lace pattern was that the openwork was set off by solid panels, so I was afraid that the crown area would look too open in comparison; in the next swatches I tried using different types of increases to make portions of the fabric look more solid. I found that increasing by knitting a stitch in the row below (see section "2" in the photo at left) was unattractive in a fabric that would be as stretched as a hat crown; this was made more obvious now that I had the rate of increases more or less figured out, and the fabric was lying flat as a result. Finally I was starting to get somewhere. In the last swatch, I really cut down on yarnovers, increasing instead by lifting the running thread between stitches and twisting it to make a new stitch (M1). I really liked the contrast between solid areas and the mini zigzag, and the areas that would segue into fountain lace were looking mostly symmetrical; for the final version of crown increases, the only change I made from this swatch was in one of the very early rounds, to make the point of the outlined triangle more symmetrical. And Emily? Well, up to now I had used Emily Ocker's Cast On for one project, with some difficulty, and when I decided to use it for this hat, I had to refresh my memory (using this web tutorial) on how it was done. And it is a little fiddly. But after doing it 7 or 8 times in a row, I think we're best buddies-- and it does create a lovely beginning for a top-down hat. My hints for a happy EO's Cast On: 1) When creating the first loop (the one pulled thru the finger loop for each stitch), make it nice and loose so you can pull the 2nd loop through it-- it will naturally tighten afterward. 2) Use a crochet hook smaller than your knitting needles; having the stitches tight will make it much harder for the needles to slip out of them for the first round or two, when you only have 2 or 3 stitches on each needle. time for some eye candy. So here's why I named this dress "Wisteria." I've finished the written part of the pattern, so all that remains is to proofread, draw a schematic, and put it all together with a photo or two. Or three. By the way, I'm afraid this one will not be a freebie--too much work and time fiddling with that lovely Chinese Lace! I just had to demonstrate what I meant when I said the hydrangeas must love all this rain; I've never seen them like this before. I mean, don't they look Seussian, like they should be blooming under Truffula trees? What's that? 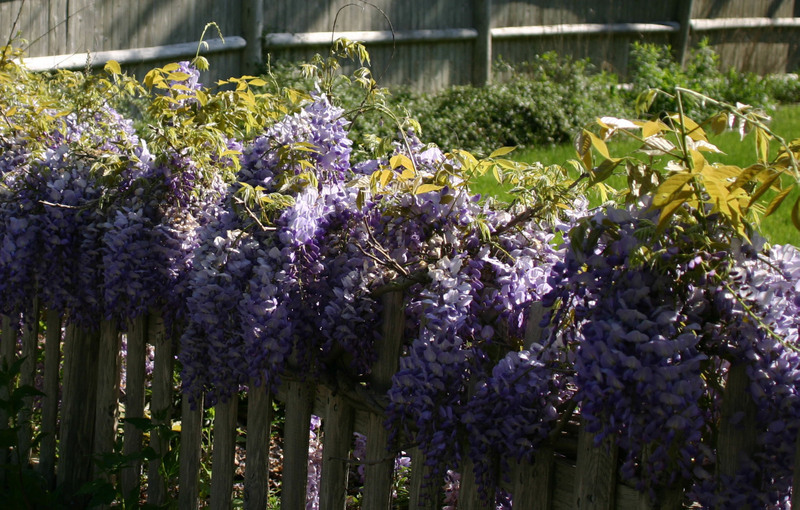 What do hydrangeas have to do with wisterias? You think this post should probably be called "hydrangea hysteria"? You don't give a flying f--- about a bunch of freaking freakishly blue flowers? Where the f--- is the CHINESE LACE? Ah, yes. Here, here she is, in child's sleeveless dress form, and I shall call her...Wisteria. Why? Well, the first time I remember noticing a wisteria vine, I was a college freshman, and knew (and cared) very little about gardens--and yet the cascades of purple flowers adorning the entrance to the Frick Chemistry Lab amazed me enough that I asked someone the name of the plant. Since then, I've seen Wisteria sinensis (or Chinese wisteria--how perfect is that?!) on buildings, on pergolas, and ascending tree trunks, and it never fails to amaze. As this dress took form, its violet color and the waterfall effect of the Chinese Lace border brought the wisteria to mind. And yes, instructions will be available soon, for girls' sizes 6 months to 10 years; I reworked the neckline today, and so the pattern should be up by (dare I say it?) next week.